Eucryphia glutinosa is the only deciduous eucryphia here and the leaves turn a nice orangy brown in autumn. The original planting which was mature in 1930, is now in a boggy area and the trees seem no worse for that. Quite easy from seed; branches touching the ground will form roots so there is no shortage of young plants. Devil's Bit Scabious is one of my favourite wildflowers. 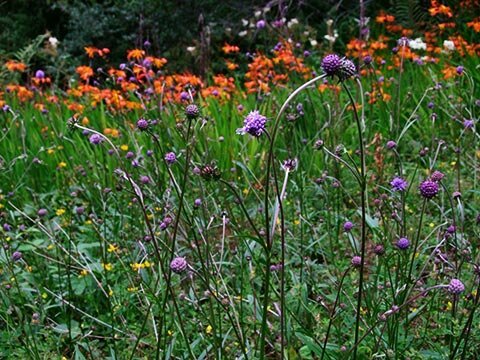 I have collected seed and planted the resulting seedlings in the "Alpine Meadow". The ones shown here with montbretia in the background were covered in scrub and brambles when I started and it was a most satisfying clearance, well worth the scratches and toil. Now, an annual clearance of undesirables doesn't take long. 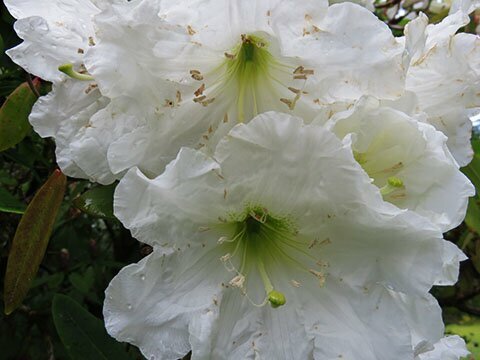 Rhododendron "Polar Bear" makes a large shrub or small tree. 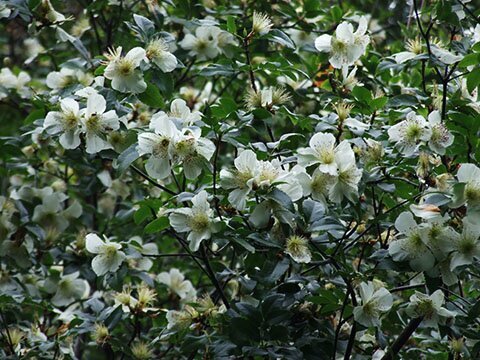 The highly fragrant flowers appear mid-July and the odd one can continue into September and even October. There are quite a number of these in the garden. The original planting is showing its age, losing vigour, but is still a splendid sight. Very slow to root from cuttings but layering is fairly successful. 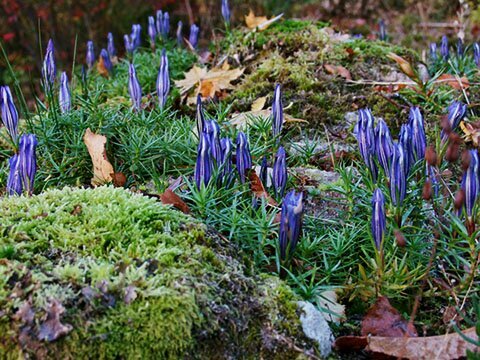 Gentiana sino-ornata, the Chinese gentian, had been grown on a rock near the foot of the drive in the 1930s. I decided to re-introduce it there with some success though it requires a little attention. It is not strong growing so any competing vegetation needs to be removed. There is very little soil on the rock so I give an annual dressing of slow-release fertiliser. I grow replacements each year which, if not needed, go elsewhere in the garden. 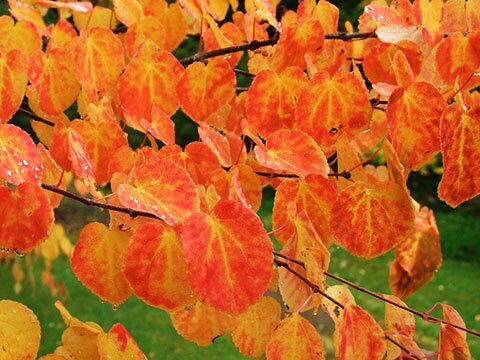 Cercidiphyllum japonicum is a lovely medium-sized tree. The young leaves are bronze then light green on tiered branches. 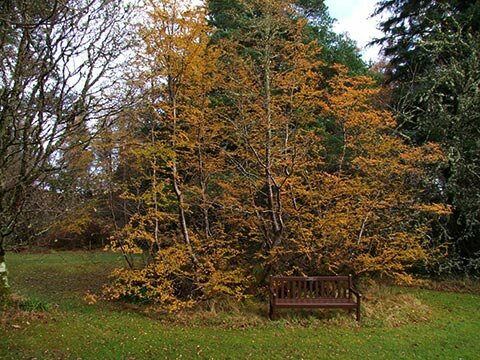 The leaves turn early in autumn with glorious colours and a sweet scent. Unfortunately, they drop early too but the fallen leaves retain their scent and are a pleasure to walk through. More visitors ask about these trees than any other in the garden. 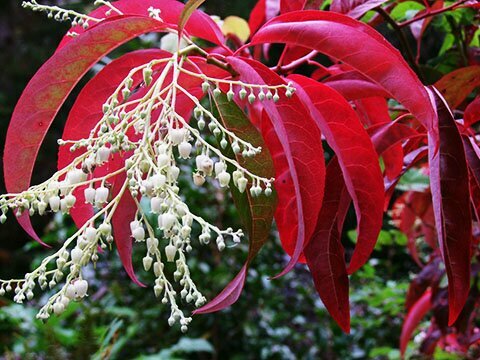 Oxydendron arboreum, the sorrel tree, is unusual in that it produces flowers at the same time as the leaves turn red before dropping. Loch View. 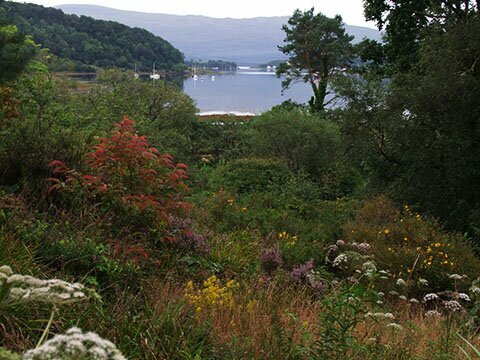 Wild angelica, a young sorrel tree and self-sown Hypericum patulum add colour to the picturesque view down Loch Aline to the Isle of Mull. Nothofagus antarctica is one member of the family known as southern beeches. This one, at some earlier stage, blew over and the branches grew vertically hence the interesting shape. Below is Archie's seat in memory of one of the kindest men to ever live here. Archie worked part-time in the garden and was much more tolerant of midges than I ever was though he did say they could be "a wee bit of a nuisance at times". 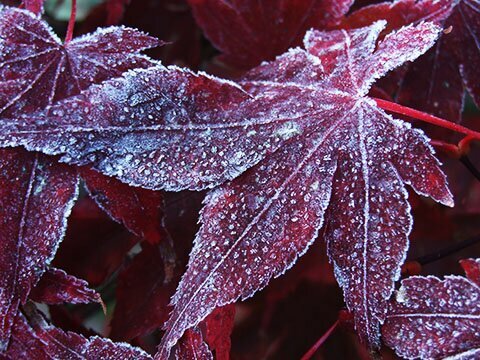 Frost on stems and leaves has its own beauty. Perhaps the difference between a wet, windy day and a calm, frosty day in late autumn enhances this. Autumn. Autumn colours in red and gold and many shades inbetween give one of the finest displays in the garden and, if the weather is good, will last for several weeks till the leaves drop. For a time after leaf fall, it is a pleasure to rustle through them, particularly if there has been a touch of frost. Berries add to the display though they are soon gone with birds and pine martens. 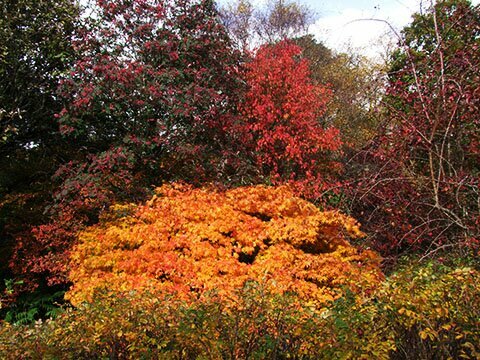 Earlier, there are some late-flowering trees, shrubs and herbaceous plants to brighten an autumn day.